Memories are life’s most precious moments in time. One way to preserve memories is pictures. Get up and do something, anything. Sometimes there are once-in-a-lifetime moments. Take a picture to capture the moment. Take a picture to remember. I share the best moments anywhere and anytime. 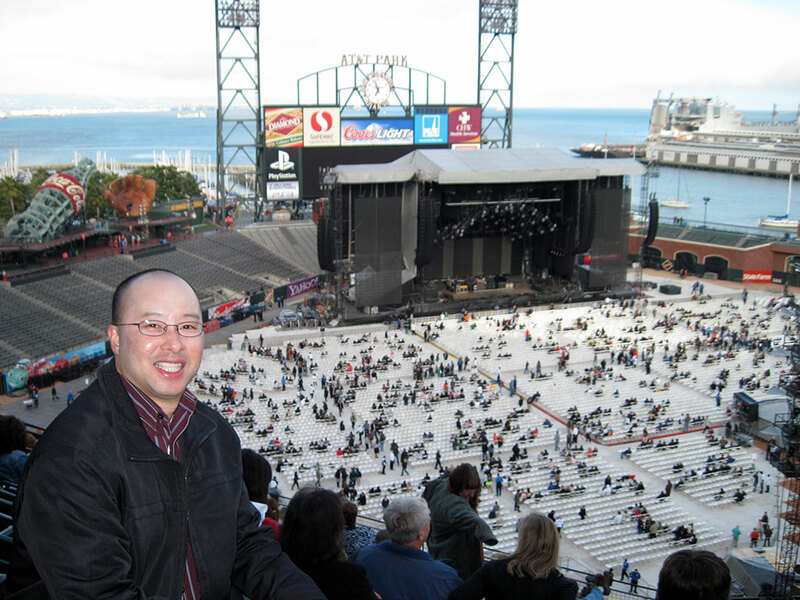 This picture is me attending Paul McCartney’s Up And Coming concert at AT&T Park in July 2010. Hiking is still a favorite hobby. A friend recommended Joaquin Miller in the Oakland Hills. 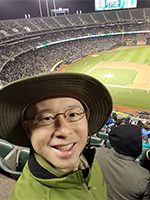 I took a Sat in Oct 2018 to prioritize an outdoor hiking activity. It felt good spending a day outdoors instead of working to strengthen my job skills and job searching. My brother got Oakland A's tickets. 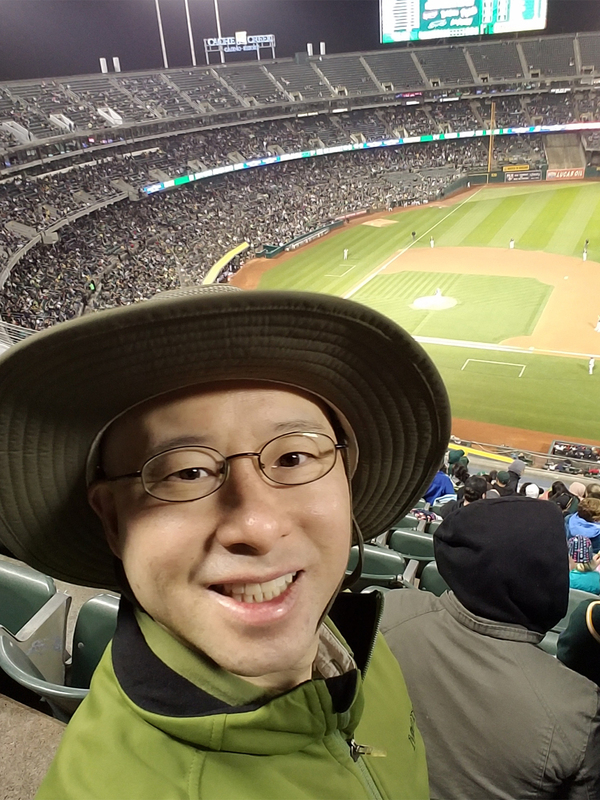 The family and I watched a baseball game on a Sat night in Sep 2018. The A's were down the entire game. The A's rallied falling short. Khris Davis hit a home run. The family watched the postgame fireworks show on the field. Two cousin weddings in the last two years. The July 1, 2018 wedding was my cousin on my mom's side. The service and dinner took place at an office park. Interesting. Here is a picture my nephew took on my phone. I have maintained my 170 pound weight minimizing eating processed foods and working out at the gym four days a week. I was in San Mateo, CA because I made an appointment at the San Mateo DMV to renew my driver's license to a Real ID. There was a cancellation. I visited the San Mateo Japanese Garden in Central Park outside downtown. It was the first time I visited the peaceful garden. My dad and I got last minute tickets from my cousin. 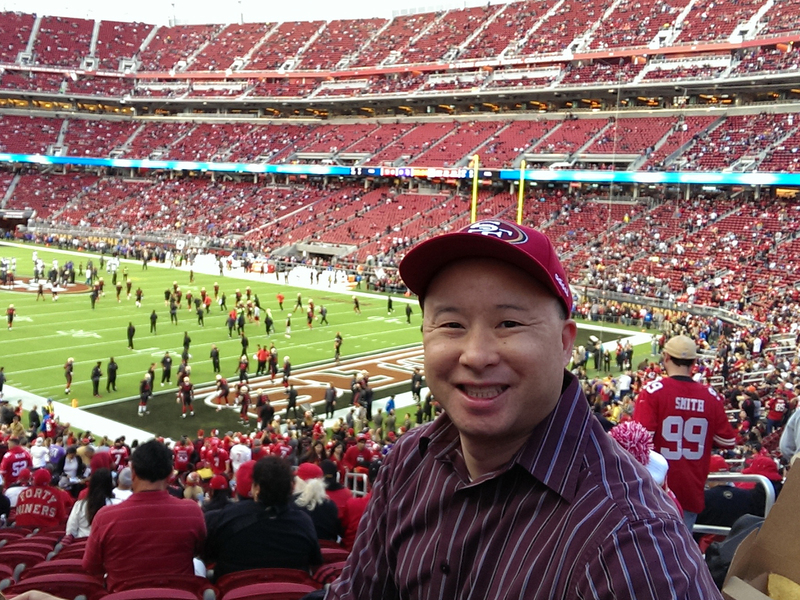 It was the third time I attended a 49ers game. The crowd was bigger than I expected despite the 49ers rebuilding the team. There were still empty seats including empty seats between us. The game was close. The 49ers lost 41-39 to begin Week 3 of the 2017 NFL season. 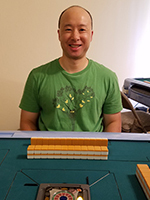 One of my favorite table top games is Mahjong. I play Hong Kong and Japanese styles. I assure everyone I play for fun. Points are tracked. Wins are tracked. There is no gambling. Money is not exchanged. Aug is my birthday month. The planning was last minute and simple. My family and I ate dinner at a Chinese restaurant. We purchased a mud pie ice cream cake at a supermarket. We ate it in my brother's house. My Mom's cousin son was married in Jun 3, 2017. 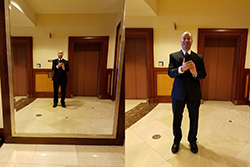 The service and dinner took place at the Marriott Hotel in San Mateo, CA. Here is a dual picture of myself two months after my surgeries. The left side one can see how big the mirror in front of the hotel lobby. The right side is a close up. 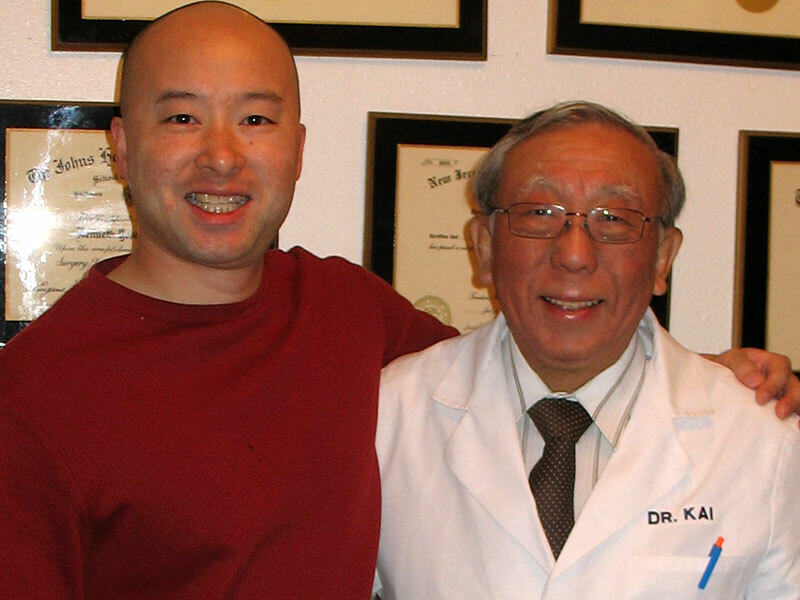 I lost eight pounds one month before my surgeries. I lost an additional 12 pounds after my surgeries. There were medical firsts in Apr 2017. I went to the emergency room at O’Connor Hospital with stomach pains. I thought I had the stomach flu. The pains were sharp like pins pinning my stomach. The doctors diagnosed me with Acute Gallstone Pancreatitis. 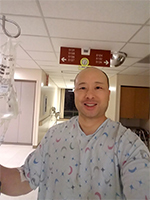 I underwent Endoscopic Retrograde Cholangio Pancreatography (ERCP) to remove stones in my pancreatic duct and Laparoscopic Cholecystectomy to remove my gallbladder surgeries. 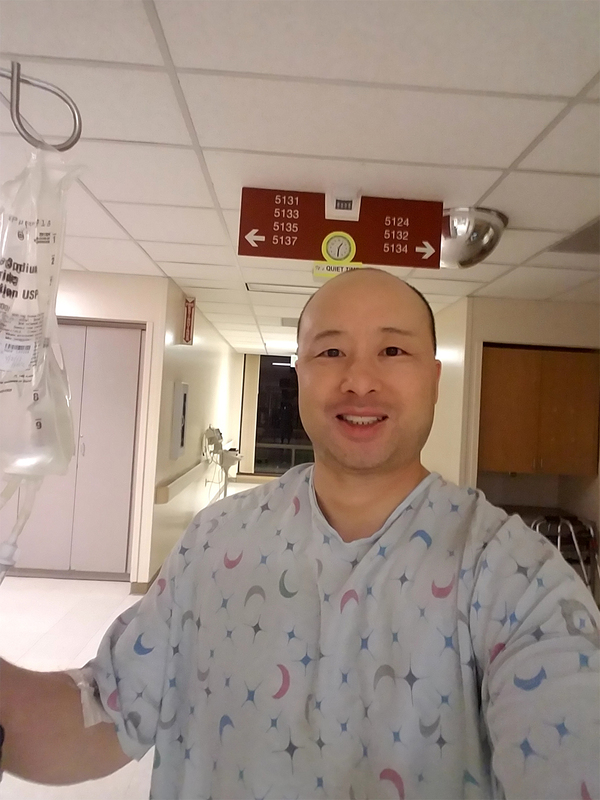 My hospital stay was five days and four nights. One of my SoCal cousins visited NorCal for his celebration graduation vacation from college. My sister and I hiked on Mission Peak with him. 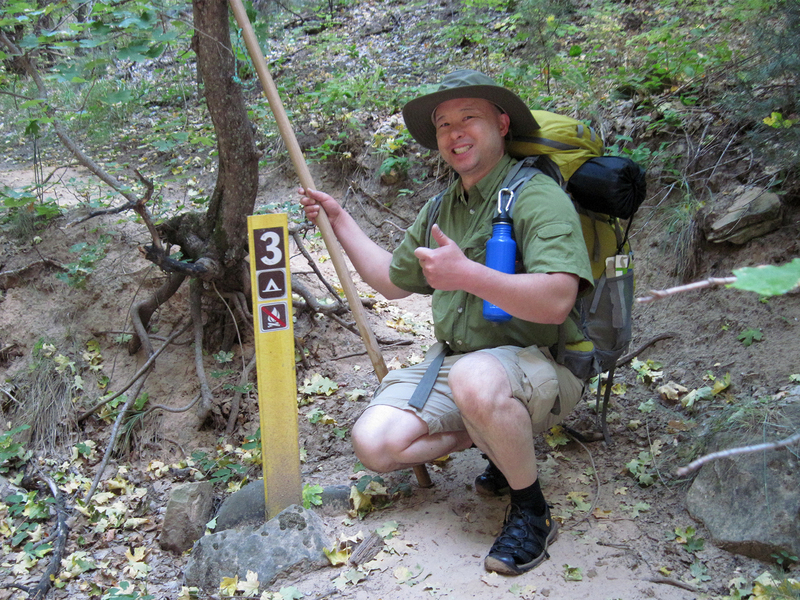 The pic is me on the Hidden Valley trail ascending to the 2,517 feet elevation peak. It was the first time I saw green grass in years on the hills because of historic record rainfall in California. I went on a solo hike for the second time in 2016. It has been a long time since I hiked solo. Hiking solo is acceptable; although, hiking with people is more enjoyable. The pic is me visiting Summit Rock along the Skyline Trail at Sanborn County Park on Oct 8, 2016. 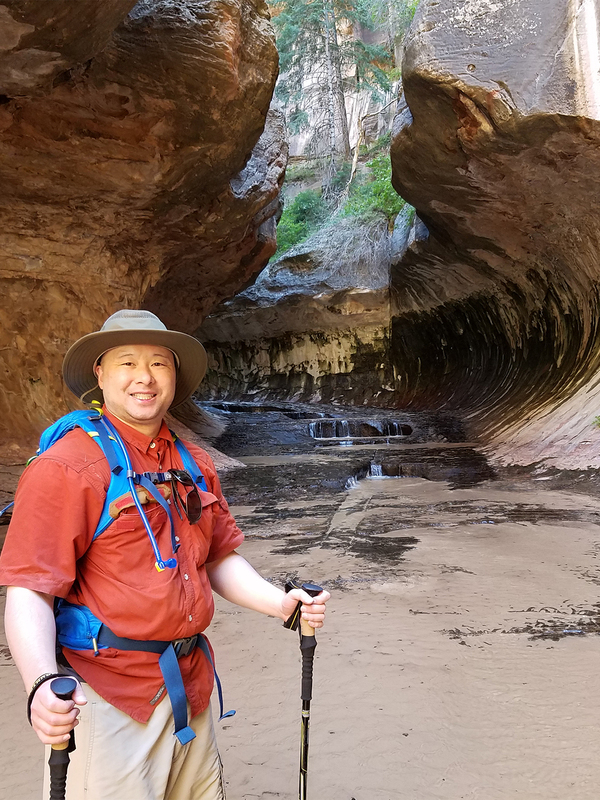 My cousin won a lottery permit to hike The Subway at Zion National Park on Sep 16-17, 2016. Day 1 of 2 we hiked The Narrows Bottom Up along the North Fork Virgin River for the second time. The pic is me at the entrance to Wall Street. The first time we visited The Narrows we backpacked Top Down. Zion National Park campgrounds were full. One of us searched for a campsite while the rest hiked The Narrows Bottom Up. He was lucky a campsite opened due to a cancellation. He hiked short Zion trails afterwards. He backpacked The Narrows in 2015. 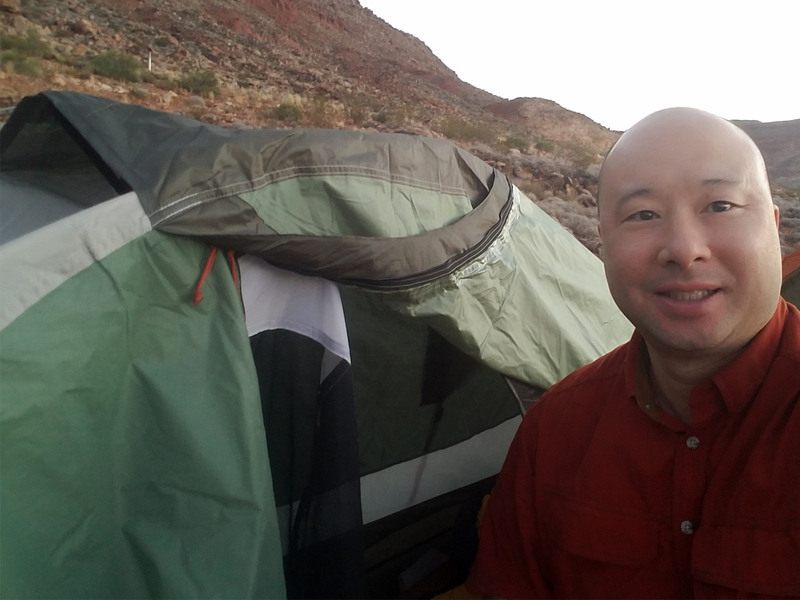 The selfie is me in front of my tent. We spent the morning breaking camp and preparing for The Subway hike. Day 2 of 2 we hiked The Subway Left Fork of North Creek upstream. All of us were shocked the nine mile hike was strenuous. The hike was the most strenuous I ever hiked. We started late. We were the last party to arrive at the trail end and to arrive at the trailhead during the night. All of us brought headlamps. The pic is me at the entrance to The Subway. A friend took us to shop at a restaurant supply warehouse for restaurant owners. The warehouse is not open to the public. The warehouse sells everything for restaurants which includes a bar. The pic is me at a bar display which includes a sink, refrigerator, and cash register. The family celebrated Father's Day 2016 at a seafood restaurant. Here is a full body picture of me in front of the restaurant on a very warm day. 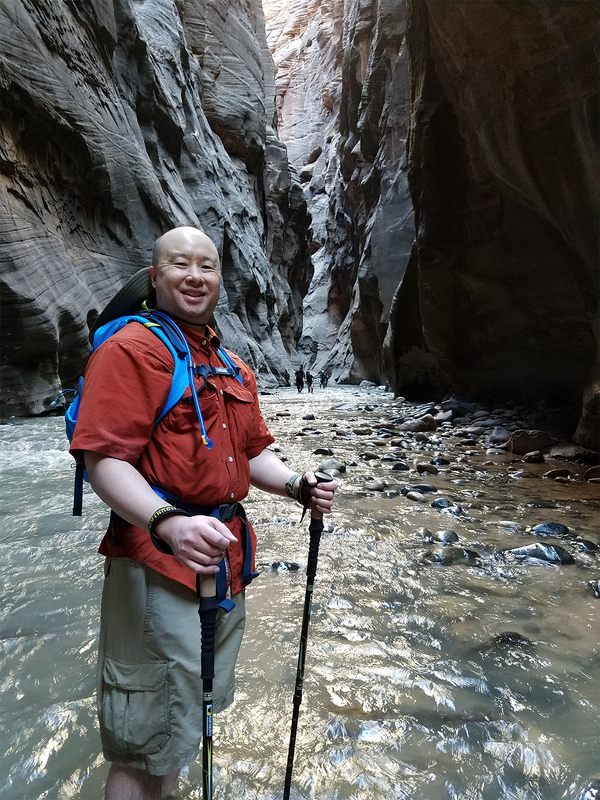 My cousin won a lottery to backpack The Narrows Top Down for two days at Zion National Park in UT. It was the first time I backpacked. I want to thank my cousin’s co-worker and his son for lending me equipment and giving me a crash course in backpacking. They are experienced. The two day backpacking trip on Oct 3-4, 2015 included backpacking down The Narrows in water. The official length is 16 miles. We backpacked 23 miles according to our GPS because we walked in winding paths due to rocks, tress, and river flow. I want to thank my cousin for organizing. The four of us treated the moment as a one-time event. Who knows when the next time we win the lottery? Las Vegas was our rest stop. We stayed at The Flamingo. My flight departed tomorrow afternoon. I took advantage of the rest stop to walk The Strip. 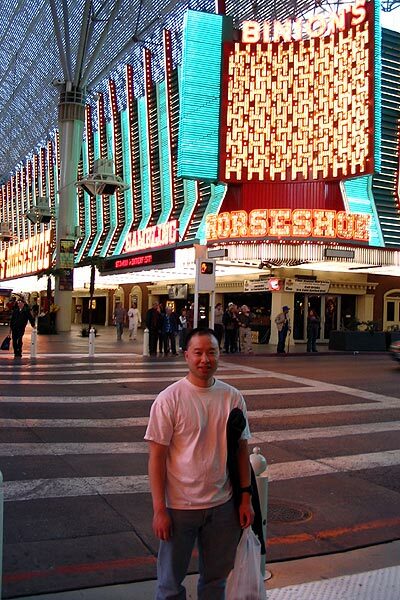 The last time I visited Las Vegas was Dec 2006. Little has changed. 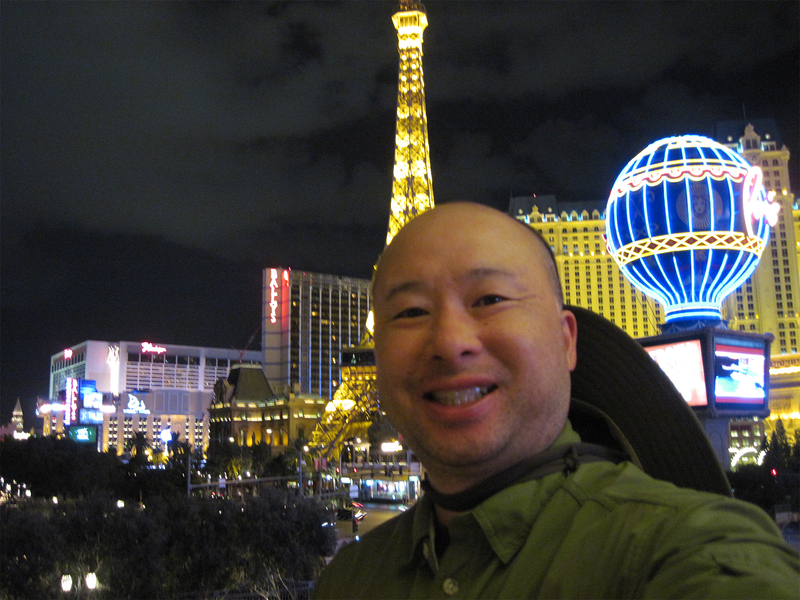 Here is my traditional selfie at the Bellagio with Paris Las Vegas as the background. My cousin couldn't attend the opening game to the 2015-16 NFL season. He gave my dad and I tickets. 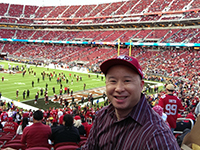 It was my first time attending Levi's Stadium. The 49ers defeated the Vikings on a Mon night anomaly win. The stadium is great for the most part. I feel sorry for those sitting on the east side during hot game day afternoons. Two friends and I hiked Mission Peak during Labor Day 2015 weekend in Fremont, CA. The 6.2 mile hike ascent and descent over 2,000 feet is strenuous. The pic is me at the summit with the "Mission Peeker" pole. The pole promotes environmental awareness. There are great views of Silicon Valley. 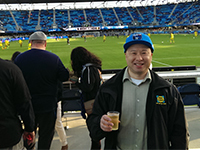 A friend who's a season ticket holder acquired tickets near the goal for a game on May 16, 2015. He invited me and four other friends. 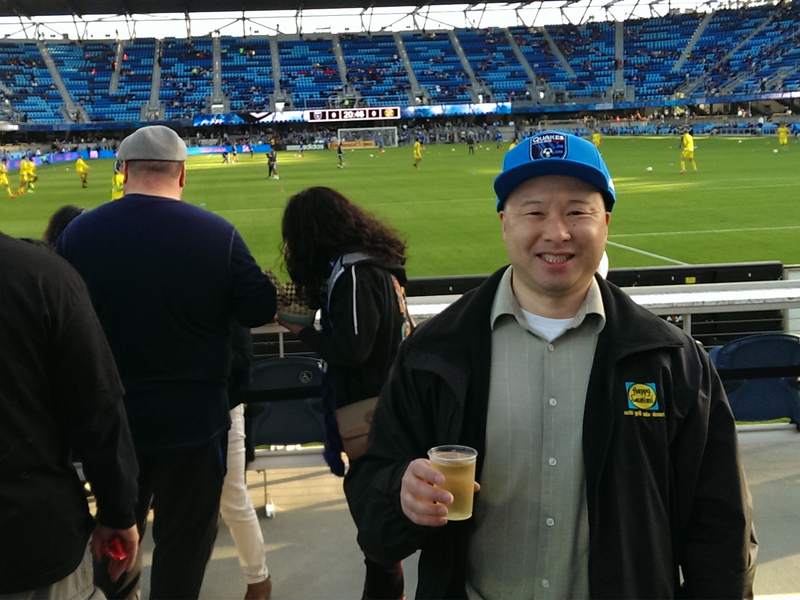 It was my first time watching a live soccer game and visiting Avaya Stadium. The stadium is known for the Largest Outdoor Bar In North America (LOBINA). The Quakes defeated the Columbus Crew 2-0. I saw Chris Wondolowski scored his 99 career goal. 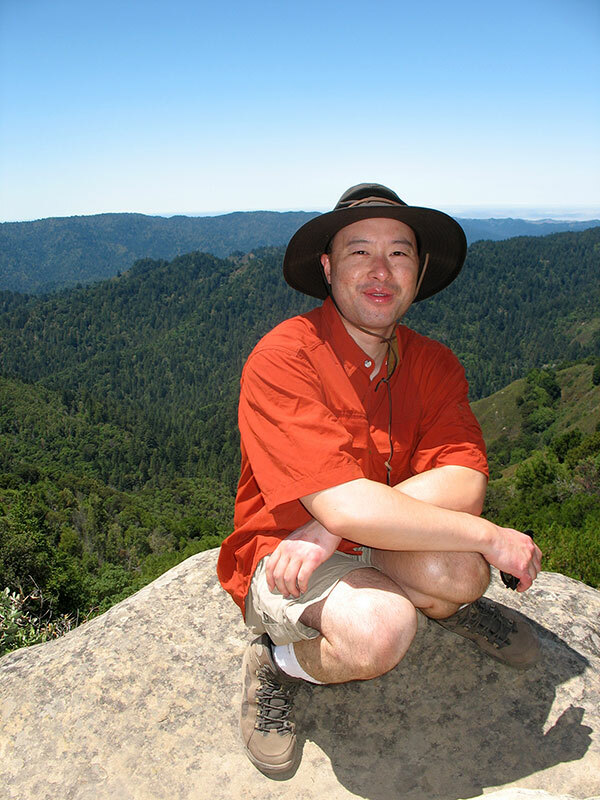 I visited Angel Island for the second time. There was less hiking because we took a paid tour around the island and visited the immigration and detainment centers. We took a ferry from Tiburon, CA which was actually better than taking the ferry near Pier 39. Parking is cheaper at Tiburon. On the other hand, there's more driving because we drove on the Golden Gate Bridge. I bring my bike the next time I visit the island. It was my second time canoeing on a river with a current that took place on Aug. 2013. I went canoeing on 1995 along the Sacramento River; however, the current went downstream with very little obstacles and the river was shallow. Personally, the 10 mile Russian River adventure was my first real canoeing. There are plenty of trees, plants, and ducks. The air is clean. The Computer History Museum's feature exhibit is a mock version of Jeopardy with Watson, created from IBM. Across the contestants' booths was a mock Jeopardy display to challenge Watson. There was no Jeopardy game board. Instead, there was a screen showing a documentary how Watson was created. Writing my name on the pad was hard. The buzzers do work with lighting up your booth and the lighted countdown. I was afraid of holding a sparkle when I was a kid. Also, I was out of town attending an anime convention during the Fourth of July a long time ago. I never had opportunities to celebrate with fireworks at any degree from sparkles to professional fireworks show. One of my uncle's family from Los Angeles visited the week after Fourth of July 2013. My cousin purchased sparkles for everyone to hold. It was fun. I missed out when I was a child. Not anymore. The Maker Faire arrived in the Bay Area on May 2013. The event took place at the San Mateo County Fairgrounds. My first impression attending the faire was the original creativity and genius minds that I couldn't do to save me life. Computers, electronics, art, foods, crafts, music, engineering, transportation, lights, science, and so much more. I thought to myself walking back to the train that there is a bright future ahead despite today's conflicts and pessimism we hear in today's media. We continue to improve our lives. I took my girlfriend on an urban hike to Bernal Heights Park on Valentine's Day 2013. It was our first time hiking the hilly park. The views of San Francisco are fantastic. We took BART from Daly City to Glen Park, followed by walking down the park to the central Bernal Heights neighborhood. Hiking is one of our favorite hobbies. We ate at a seafood restaurant in Half Moon Bay for dinner. There is a Fentons Ice Cream shop in Nut Tree located in Vacaville, CA. We shopped at the Vacaville Outlet Mall in Dec 2012. Fentons was featured in the final scene of the movie UP. Fentons does exist. The ice cream is expensive. Customers pay for the freshness. Their restaurant food is a typical diner style menu. Everyone should eat a Fentons ice cream once in their life. My girlfriend and I hiked in the Portola Redwoods State Park. I was ready to climb Old Tree, a 280 feet tall and 12 feet in diameter. Nah, I didn't climb it. Thank goodness we had insect repellant because there were lots of bugs and mosquitoes. Another moment I remember for a long time is I got stung by a bee on my left hand. The bee landed on my left hand. I panicked. The bee stung me. My hand was swollen the size of a quarter and it stung throughout the hike. I went to a gathering at the Felton Covered Bridge Park in Felton, CA. The bridge was built in 1893 that served as an entry to Felton for 45 years. Today, the bridge is a pedestrian bridge that connects the park to a horse viewing area open to the public, a trail, and residential homes. I wear appropriate and better clothing the next time I visit the park for that bridge pose. I have the hat. My girlfriend took me to Stanford University to visit Hoover Tower. Hoover Tower is dedicated to the life of President Herbert Hoover. The cost is $2 to visit. There is a museum on the ground floor. The picture is me overlooking The Oval. You get a 360 degree view from the tower. Good sights of Stanford University, Silicon Valley, and the mountains west of Palo Alto. If you want to visit a city, make it an urban hike. My San Francisco urban hike was walking along the Embarcadero. We started at the Cal Train station and visited the following places: AT&T Park, China Basin, South Park, Coit Tower, Telegraph Hill, Ghirardelli Square for a sundae, Musee Mechanique, and Fisherman's Wharf. We took a trolley back to Market St. and walked back to the Cal Train station. Fun times! My brother got free tickets to an Oakland A's baseball game in 2012. My brother, nephew, parents, and I watched the Oakland A's defeat the Cleveland Indians. We met up with my brother's wife and niece for a dinner in Oakland's Chinatown. The A's needs a new stadium. The O.co Coliseum is garbage. Musee Mechanique is an arcade museum. Free admission. I highly recommend people visit. Play games from the early 1900s to today. Get your fortune. Another activity in my wish list checked off. 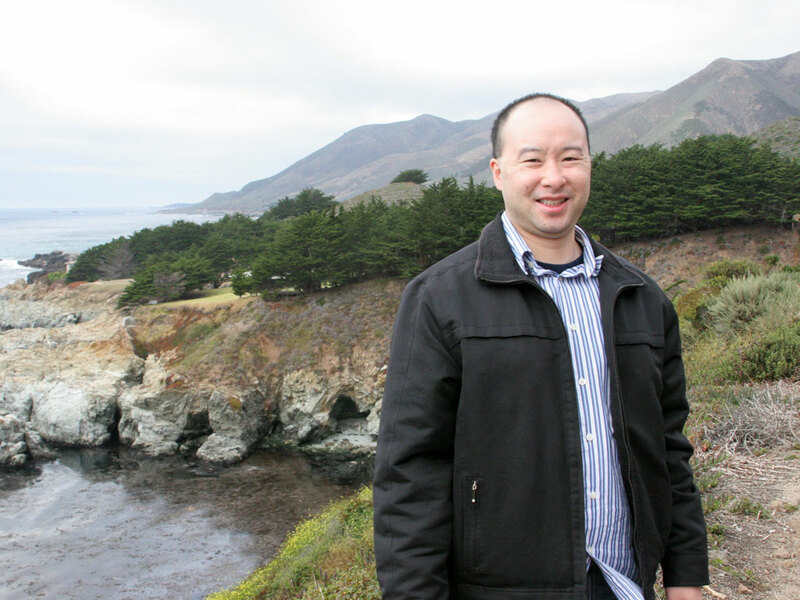 Visiting Angel Island for the first time is an example of seeking new adventures and new experiences. We hiked to the top of Mount Livermore where people can see a 360 degree view of the entire San Francisco Bay Area. We were lucky the weather was not too hot and not too cold and the skies were clear. The next time I purchase a new pair of glasses, it's going to be similar to the pic on the left. I feel dark rim glasses look good on me. I look more Chinese, lol. I like the thick rim because I have a big face. The thin rim is too small and can cause mild headaches. I needed to buy a new pair of sunglasses because my last pair became too small. Picture was taken from my smart phone. I attended The San Francisco Food Festival's third annual event held in the Mission area. There were many people who attended and ate and drank from at least 30 food trucks and vendors. There was plenty of food from various ethnicities. Admission is free. The pic on the left is me holding a Pad Thai Taco and ginger lemonade. Take my pen and check off another item on my life wish list. 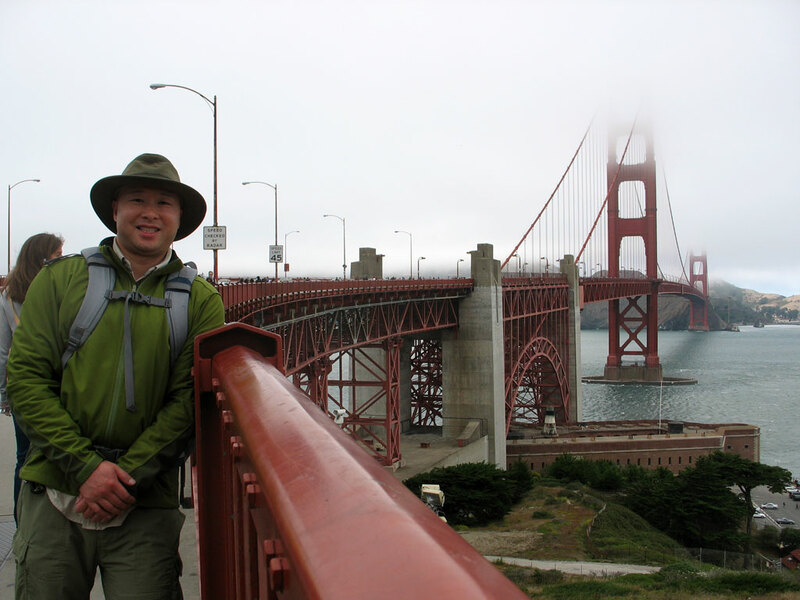 I walked the entire span of the Golden Gate Bridge round trip in Aug 2011. The weather was perfect. It was cold and foggy. I didn't worry about getting sunburn and sweating. We parked at Crissy Field and walked to the bridge and back. The total hike was 7.7 miles, my longest hike. Downtown Redwood City has annual summer events. One event is the Thursday Night Movie at the Courthouse. The movie was Indiana Jones And The Last Crusade. I took a picture of me with the movie screen as the background. A bag of popcorn is $1. The temperatures are cold at night despite the summer weather. People brought blankets. I hiked on the paved walking trail at Stanford's Dish Area. Walkers can see the huge dishes. There are cows along two areas of the trail. The up and down trails are easy for most ages. Bring water and dress appropriately. My dad got two tickets to a San Jose Sharks playoff game during the 2011 NHL Playoffs. It was my first time I watched a live hockey game that also satisfied my first time I entered the HP Pavilion and my first playoffs game from a major sports. The Sharks won in overtime from Joe Pavelski overtime winning goal. Oh, there was a fight. 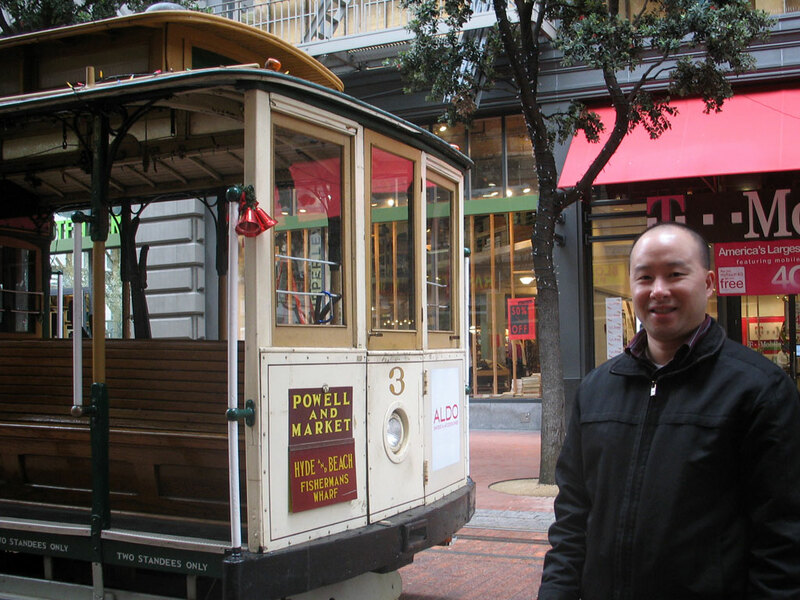 I went on my first ride on a San Francisco Cable Car in Dec 2010. We took the cable car from Powell and Market to Hyde and Beach in Fisherman's Wharf. Everyone who lives in the San Francisco Bay Area must ride the cable car once in their life. I went with my parents and my uncle and aunt to Monterey and Carmel for the day. We ate lunch at Monterey's old fisherman's wharf. I enjoyed the day because I saw new sights and visited new places in Monterey for the first time. In Carmel, the city expanded the shops and restaurants. The last time I visited Carmel was in 1987. I remember Carmel had a few streets with shops and restaurants. Unfortunately, I got sick after the one day trip. Lesson learned: eat to keep yourself energized. Seafood was a meal not to get fully energized. I must remember Washington Canada '08 when I almost got sick. I never visited Big Sur before. The last time my uncle and aunt went to Big Sur was a long time ago. We drove south on Highway 1 to Big Sur. Big Sur is actually a small town. We stopped off a few scenic spots to take pictures. We also stopped at Pfeiffer State Park. Pfeiffer has trails from easy to hard and has a hotel for weekend trips. Pfeiffer State Park was where we turned around and drove back to Monterey's Cannery Row for dinner. My dad's celebrated his birthday taking us to tour caverns in Central California in Aug 2010. The first cavern we visited was Moaning Cavern. The weather outside was in the high 90s. The weather in the caverns is a consistent 63 degrees. We took the short Moaning Cavern tour which consisted of a long and steep spiral staircase. There is another tour option which allows the person to crawl deeper inside the cavern requiring a helmet and flashlights. Nobody felt any earthquake should it happen on the surface. We continued my dad's birthday celebration visiting California Cavern in Aug 2010. The second cavern was a longer tour that required hardhats, optional flashlights that actually were useful, and no big backpacks because of the narrow walkways. Inside the cavern we learned the founder of the cavern charged money for people to enter inside. Parties, marriages, and religion services were held inside the consistent 60s degree weather. It's great taking a break from our normal routines and anime; in particular, cosplaying. My two friends who went with me to the California Academy of Science took a break from their passion anime hobby which is cosplaying and I took a break from keeping myself busy with other stuff. The pic is us on The Living Roof exhibit. We were lucky to find parking on the street within a reasonable walking distance. 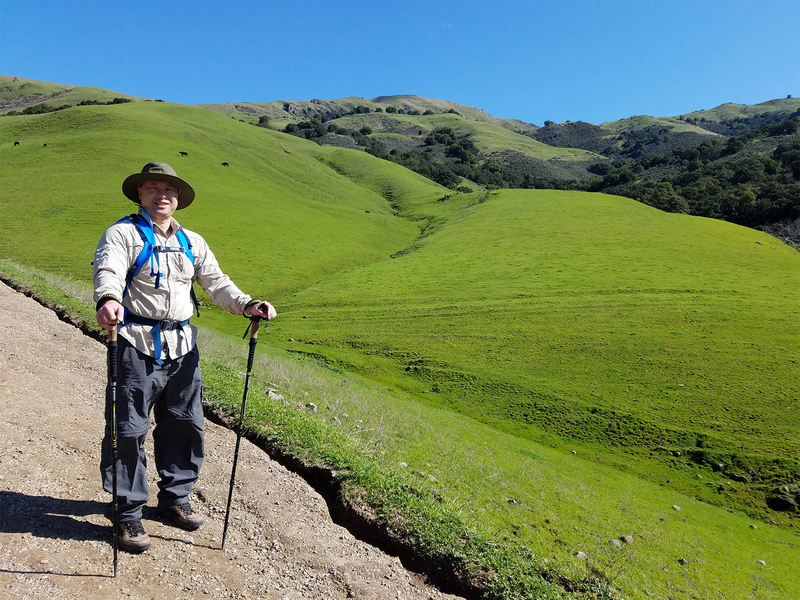 My first visit to Monte Bello Open Space Preserve in Palo Alto, CA turned out to be the toughest and longest hike I walked. The toughest part was the insects flying in front of my face. Lesson learned: spray insect repellant. 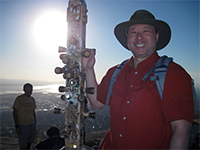 The repellant worked when I hiked at Los Trancos, an easier and shorter hike across the street from Monte Bello. Hikers can see parts of the San Andres Fault. Monte Bello and Los Trancos are part of the Midpeninsula Regional Open Space District. The highlight of my summer vacation was going to a Paul McCartney concert in Jul 2010. His Up And Coming Tour included San Francisco at AT&T Park. The last time McCartney played in San Francisco was the last Beatles live concert. At 68 years old, McCartney was absolutely fantastic. He played popular Beatles songs Hey Jude, Let It Be, All You Need Is Love, Something, All My Loving, A Day In The Life, Get Back, The Long and Winding Road, Yesterday, and Paperback Writer. I found another place to escape the hot summer days. I hiked at Point Lobos State Park minutes south from Carmel along the California coast concluding my 2010 spring vacation. 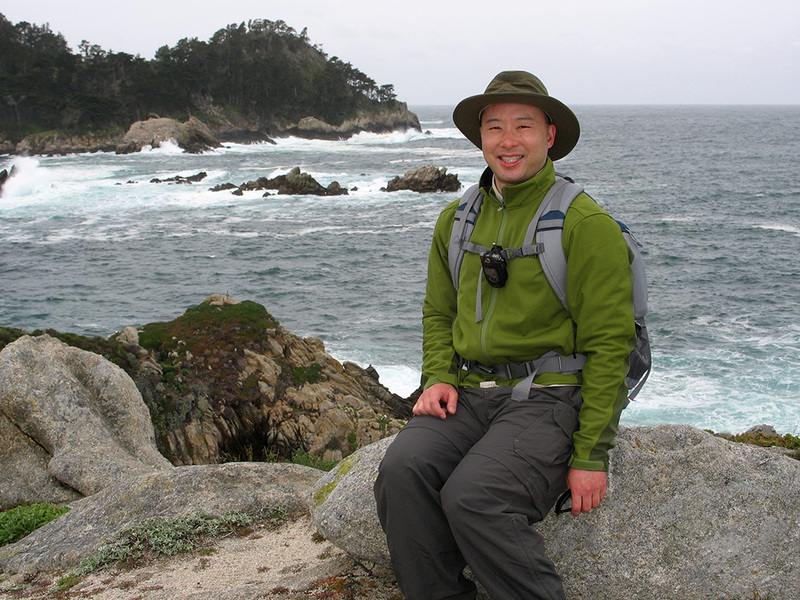 Point Lobos is a family friendly, easy trail to hike. The trail has everything including wildlife, sea animals, ocean, and deer. My first activity during my 2010 spring vacation was a hike to Pinnacles National Park located in Paicines, CA and south of Hollister and outside Soledad. I went with three friends. Each of us carried food, water, and flashlights. Yes, flashlights. There were two caves with no natural light. Some trails were easy even the elderly had no problems walking up and down the hills. Pinnacles is best visited outside the summer. I ice skated for the first time. I used to rollerbladed in 1996-1997 and again in 2000. I had a great time! I fell down once. 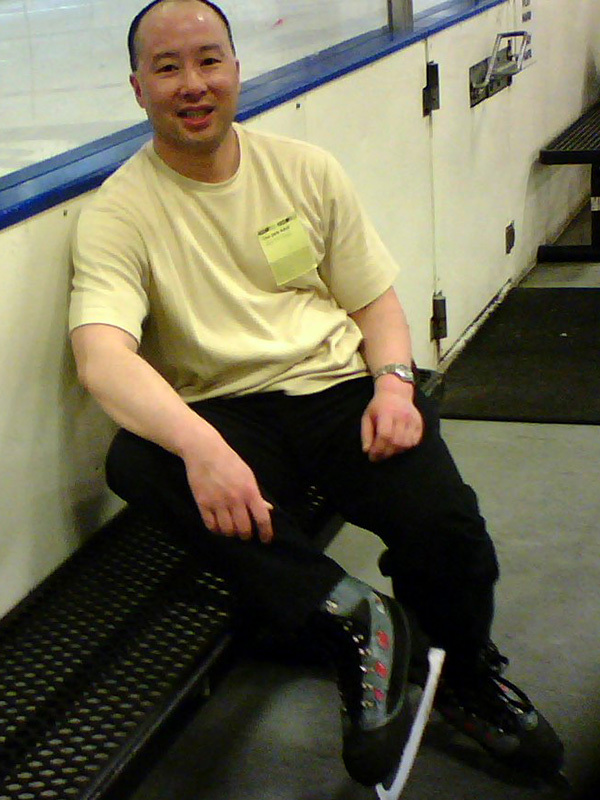 I plan to take ice skating lessons and ice skate more often in the summer. It a great way to beat the heat. Pic taken from my cell phone. What Tile To Throw Away? I started to play Riichi in late Oct '09. I actually started to play in 2007 and I quit because it was too difficult. I was wrong. Riichi is not difficult. Just play and make mistakes. It's helpful to have friends who know the game. I already won my first game. The picture is me playing Riichi at San Jose State with my friends and acquaintances. Sometimes I cook dinner for the family. I really want to learn more cooking. My cooking skills are such that I know enough to survive on my own. I'm weak on stir frying and weak on making food taste good. I need more practice and more learning. I started taking dance lessons from my sister. 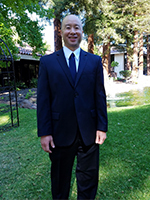 I continue taking dance lessons at De Anza college and learning salsa at the free salsa lessons. Unfortunately, salsa is my worse dance because I'm a slow learner. Smooth dances are my favorite and my best. I always find time to dance. I'm searching for a regular dance partner to practice dancing out of classes. The person who snuck up behind me is the dance instructor assistant. She has been dancing for at least five years. Pic taken from my cell phone during Winter 2010. Bluffing and lying are a good skill. Use timing and discretion when you need to bluff. One of my all time favorite games is Balderdash. It took me 10 minutes to understand the game. What is the plot for the movie "The Outing?" My answer was, "A dog goes to a park to bury a bone." Or how about "That Sinking Feeling?" Balderdash is a game for friends and family played anyway the group wants. Pic taken from my cell phone. Appu and I watched Riverdance at the San Jose Center For Performing Arts in Dec 2009. I always wanted to watch Riverdance since the first year it was released. Riverdance was touring for its farewell performance. I purchased the soundtrack at the gift shop. Irish music is awesome! The Mar family with my parents, my brother, my sister, and I. Why did my brother get Band Hero? Just kidding. The music selection is good. Beatles Rock Band is awesome! I'm playing guitar left handed. I'm terrible at guitar; however, I did a good job playing left handed. Perhaps, I'm left handed when it comes to playing the guitar. My nephew is banging on the drums while my niece and my brother are watching. I visited my friend who lives in Washington in Dec 2009. 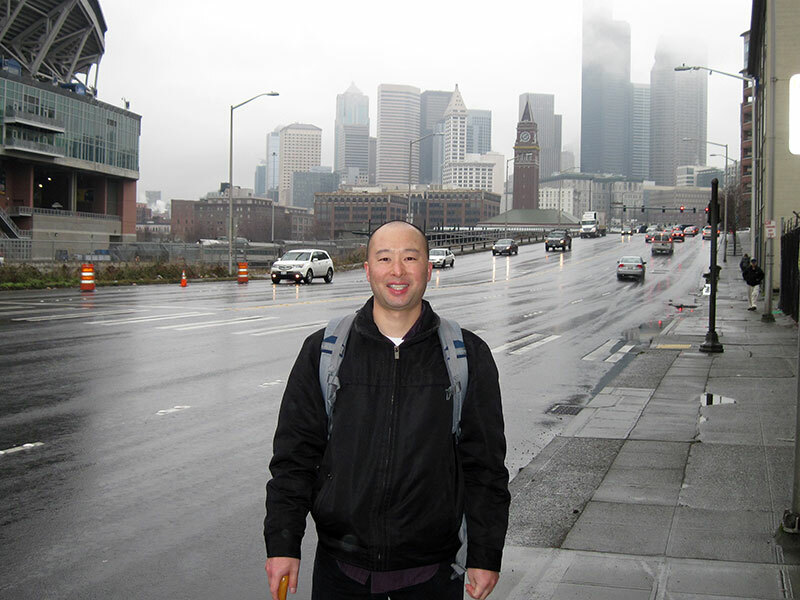 On our way to Kinokuniya Bookstore, a Japanese bookstore, I took a picture of Downtown Seattle on the background. I like rainy days. The rain continued throughout the day. Every time I visit Washington we make an effort to visit Victoria. It's an opportunity to visit a foreign country. The prices were very expensive. I still see no potholes and I see cars stopping when people cross the street. I was eating a late dinner at The 24hr Gourmet. I was playing with my cell phone. I took a pic of myself randomly. I realized I see what my cell phone camera is going to take looking at the front display. 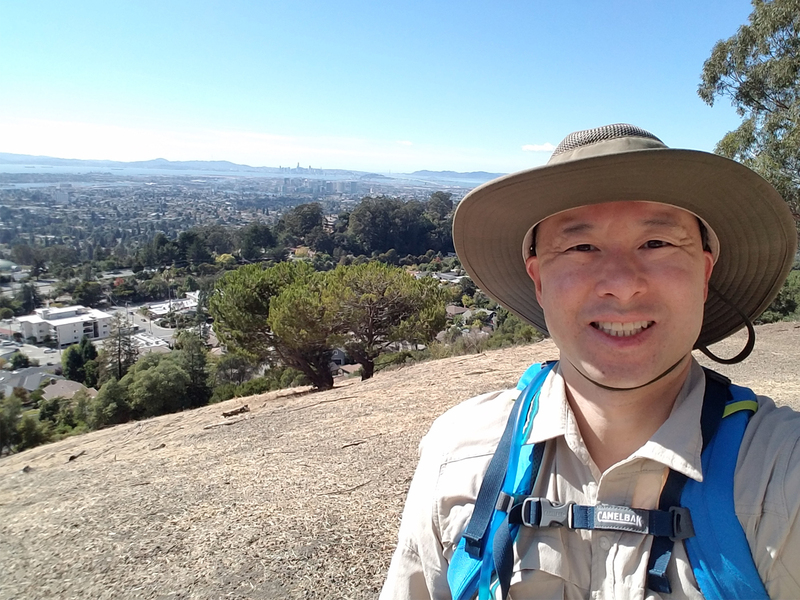 I hiked a new trail on Castle Rock State Park. I walked on Ridge Trail that leads me to Goat Rock. It's possible to climb on Goat Rock. It's very steep and slippery you actually need rope. Once you on the rock, the sights are great to see. My parents went on an 11 day cruise that departed San Francisco in Sep 2009. I took advantage of being in San Francisco by walking around Fisherman's Warm, Pier 39, Ghirardelli Square, and San Francisco Maritime Park. I celebrated with 35th birthday with my family. The picture is with my family. We ate pizzas for dinner. I hiked at a second park located in Los Gatos. Castle Rock is much closer to Uvas County such that I have been hiking at Castle Rock. I'm looking forward to hike at new parks. And I want to hike more than once a month. I ate a Cinnabon for the first time. I never eat a packaged processed cinnamon roll ever again. Cinnabons are amazing! Everyone was free one Saturday and we were choosing what we wanted to do. 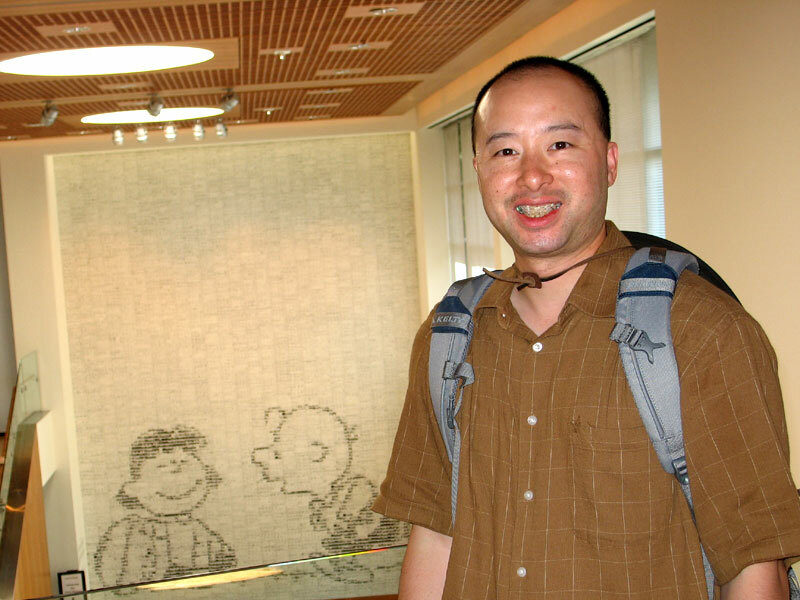 Three of us including myself went to the Charles M. Schultz Museum in Santa Rosa, CA on Jul 2009. Schultz's comics remain timeless art and the laughs always happen. I never drank chocolate milk when I was a kid. The picture is me drinking chocolate milk for the first time. I believe kids must drink chocolate milk once in their young lives. There are waterfalls and hiking trails in Northern California. I hiked the Uvas Canyon trail in Morgan Hill, CA. The picture is me in front of Basin Falls on Sat Apr 25, 2009. The last time I hiked was Yosemite in 1995. The park is about 45 minutes from my house. Looking forward to return and walk longer trails. Californians are lucky! I was at Costco shopping for groceries. I saw the trees in the parking lot blooming. It reminded me of cherry blossoms. The California Roll is not sushi. 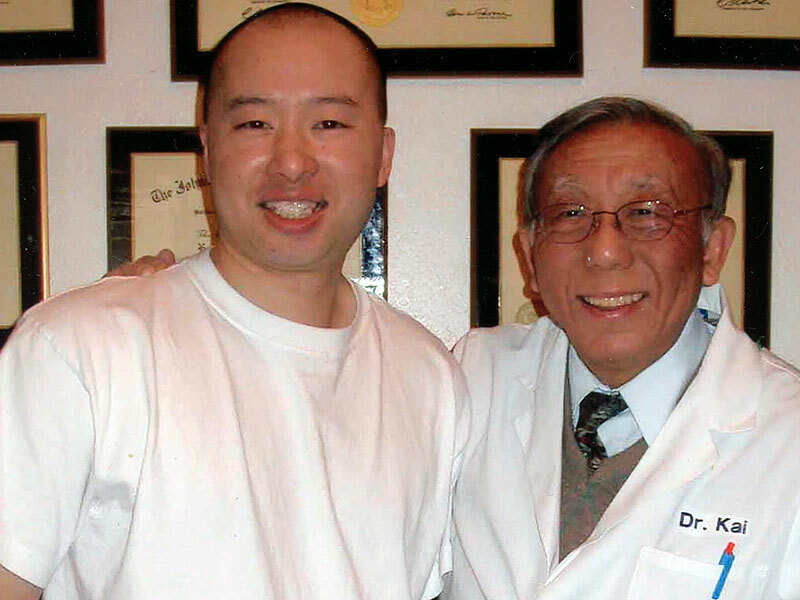 I started eating sushi in Dec '08. The only sushi I ordered is the dragon roll. Why the dragon roll so far? The dragon is my power for one of my cosplay characters. One Friday night my friends visited my house. We enjoy our company playing games and random talking anything. Our common interests and hobbies include anime, computers, and laughing about the daily view. I learn a lot from my friends and I'm grateful ^__^ Missing in the photo is Lisu. My Dad and my friends helped me build the Gaming PC. I'm in my pj's (lol) transferring files from my laptop and I'm testing the dual monitors. There were plenty of great deals and sales. I took advantage of the recession. One of these days I have three monitors. My parents, one of my Uncle's family from Southern California, and I visited Stanford University during the Christmas holiday. Picture is my parents and I in front of the church. The church was closed. Many visitors and there was a wedding photo shoot. The first minutes after I entered my brother's house, his son wanted to play toys. I imagined my nephew imagining driving the entire world-meaning driving a vehicle with the world attached at the back ^^ Toys and oranges were a great one-two combo. Play toys and eat healthy. I don't remember when the last time my family had a great Christmas. My brother's two children experienced a great Christmas with the family. Pic taken Christmas 2008. My Dad, Uncle, Aunt, and I went to the California Academy of Sciences at Golden Gate Park in San Francisco, CA on Mon Dec 22, 2008. The crowd was big and the line was long for tickets and entry. Well worth your time to visit with family and/or friends. Go early to get tickets for the planetarium. We couldn't get planetarium tickets. We were lucky to get tickets for the 3D bug show. 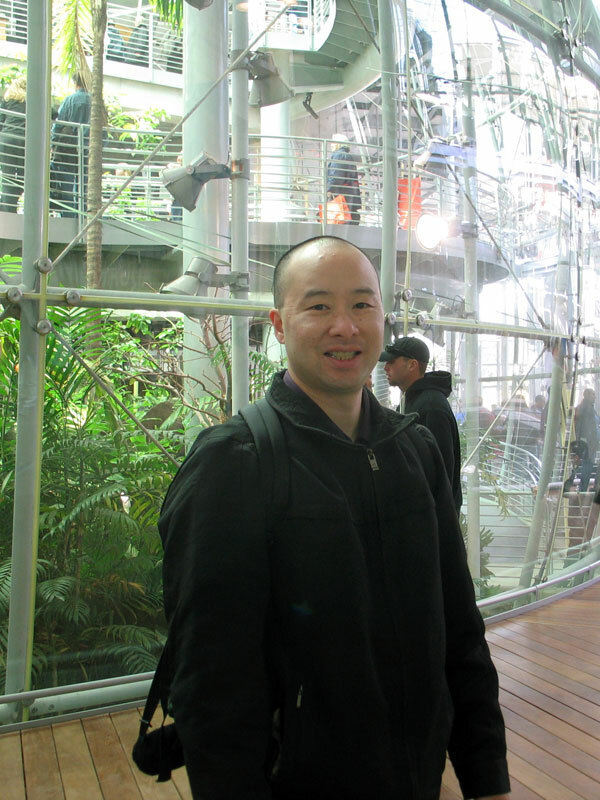 I visited my friend Steve in Washington on November 2008. On day 2, we took a ferry from Bremerton to Seattle. Here at the marina, the water fountain's force was strong. I must be quick to tap the water or else the water splashes on me. The fountain arches from the water source on my left. People could walk under the fountain water arch. On day 1, we went to an Indian casino. I won $150 playing craps. Steve and I arrived at Hurricane Ridge before it closed on day 3. There were us and another party. The strong winds made the 47 degrees worst. Love cold weather :3 BTW, Steve is taller than me. The visitor's center and the bathrooms were open only. Gift shop was closed. We saw a deer on the way back to Port Angeles. Day 4 we visited Canada. I'm in front of the entrance to Chinatown. The Chinatown was clean no stinky smell compared to Chinatowns in the United States. I didn't find the red Chinese house I sworn I saw in '05. 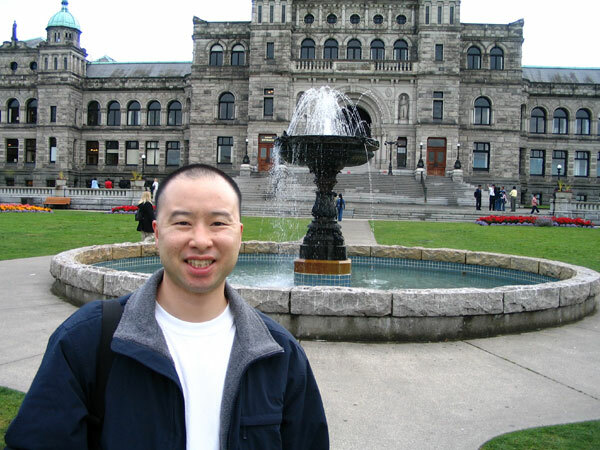 Another picture of me in front of the British Columbia Legislative Buildings in Victoria, British Columbia, Canada. 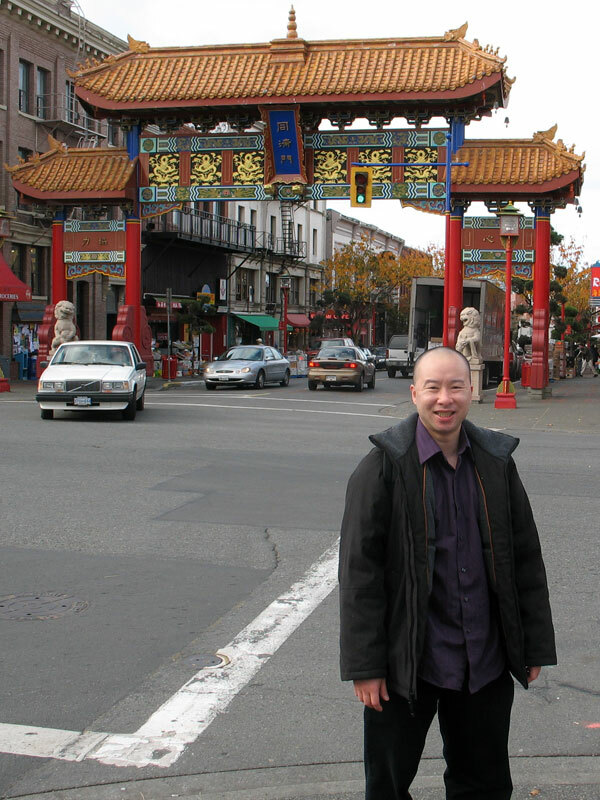 I took a picture in front of the building when I visited Victoria in 2005. Day 5 was being in the Seattle and Tacoma area. The REI store in Seattle has an indoor wall climb. I climbed the easy path. I almost quit at the halfway point. My spotter encouraged me to continue :] See with my mind. I solved the most difficult climb area. I breezed the rest of the climb. There was no section for the climber to go over the wall. There was a triangle rope section. Touch it and I made it to the top ^O^. Victory!!! Finally, rain in Seattle on day 6. 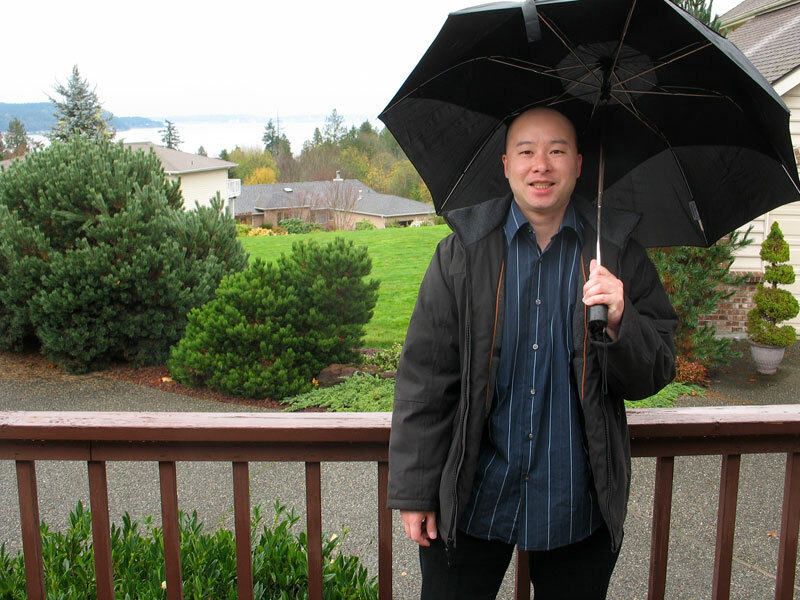 I experienced rain in the Washington Canada 2005, but not in Seattle. I take Port Orchard as Seattle, LOL. Washington rain is clean, crisp, and drinkable. The rain happened in the morning only. We went to the rock 'n roll and science fiction museum. My family's house was tented for termites in March 2008. We stayed at our brother's house for three days and two nights. We moved all chemicals to the backyard and brought all food and perishables items. The event was a lesson to plan ahead what to bring, what to move, and prepare for the exterminators to do their jobs. On May 19, 2007, I purchased my first car from my neighbor. He and his wife moved to Virginia to be closer to their family. They sold their second car which is a 2005 Toyota Camry. Having the car makes me feel more independent and I can visit more places. I promise I take car of the car including oil changes with Castrol oil every 5,000 miles, tire rotation, and car washes. On March 19, 2007, I started working as a contractor at Cisco. 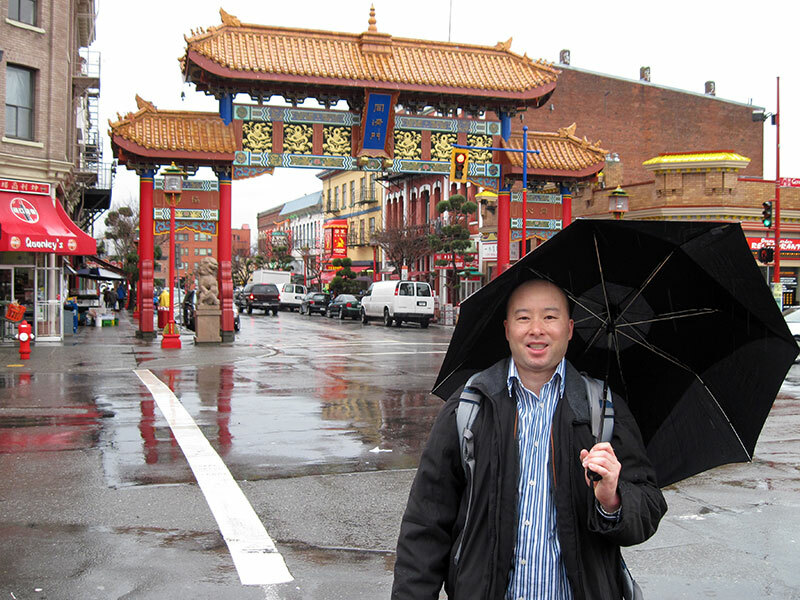 On my second week, my department held a four day off-site meeting in Vancouver, BC, Canada. The off-site included meeting everyone in the department around the world, games, training, overviews of last year, goals, sharing ideas, and having fun. The last day of the off-site was half day. Many people went home on the last day. Few went home the day after including me. I walked around downtown after the off-site ended. 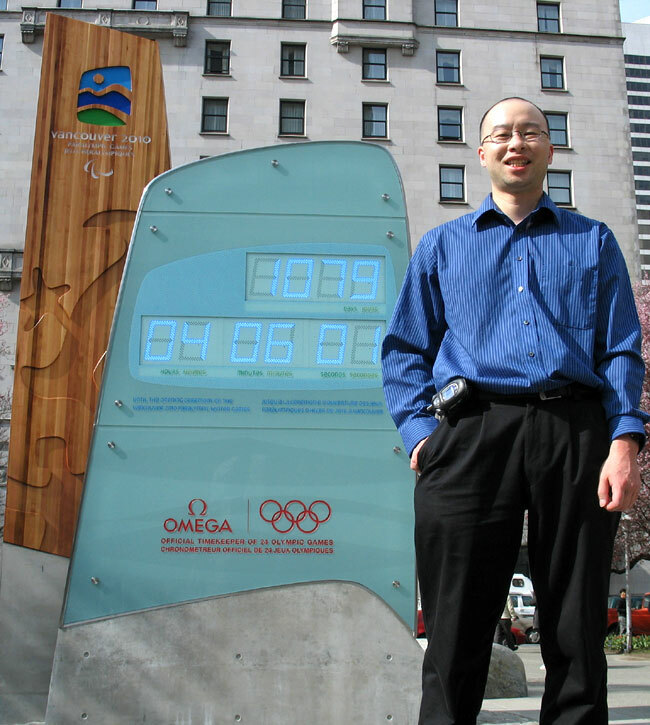 The picture is me standing next to the 2010 Vancouver Olympic clock in Downtown Vancouver. Here is another familiar picture. Steve and I went on a three day, two night trip to Las Vegas, the same as our Las Vegas trip 2004. We had fun in 2004 we choose to take another mini trip in December 2006. 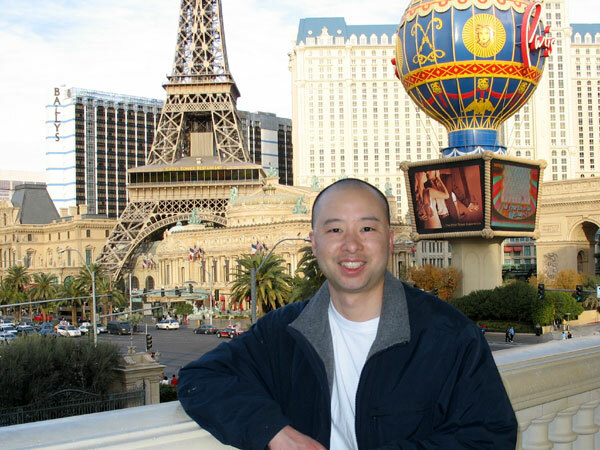 Here is my traditional picture of me at the Bellagio with Paris Las Vegas as the background. The Bellagio is my favorite casino. My first visit outside the United States was Canada in August 2005. My friend and I stayed in British Columbia for two days. The first day was in Victoria. The second day was in Vancouver. It rained on both days. 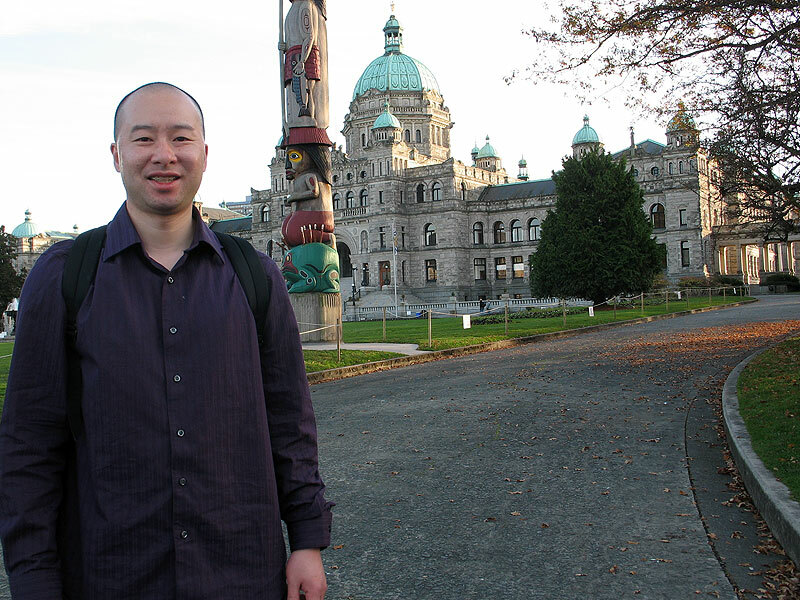 The picture is me in front of the Legislative Buildings in Victoria. To travel from Victoria to Vancouver, my friend and I took a ferry. We parked my friend's car on the ferry's bottom floors and then we rode the ferry on the top floors. The ferry included a gift shop, arcade, cafeteria, restaurant, play areas for kids, and much more. It was like a mini cruse. The total trip was approximately one hour and a half. After visiting Canada, we drove back to Washington. My friend took me to visit Seattle. It was my first visit in Seattle. The picture is me in front of the world famous Pike Place Fish Market. The workers didn't throw fish around at the time of visit. Pike Place was really busy with lots of customers and vendors. Earlier in the day, we visited the Space Needle. My sister graduated from U.C. Davis. Here is a family picture taken outside the gym where the graduating ceremony took place in June 2005. Here is a familiar picture. 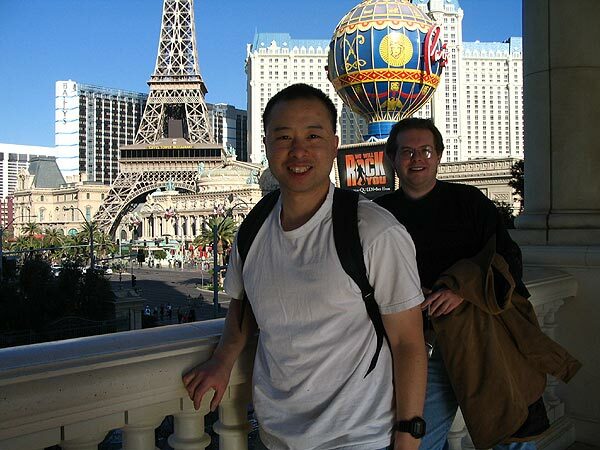 A friend and I went on a three day, two night trip to Las Vegas in December 2004. It was the first time I visited Las Vegas off season. There was no traffic, very little people along the strip, and the malls were empty such that it was easy to walk around. The weather was similar to San Jose. 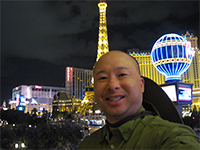 My friend and I took some time to visit Binion's Horseshoe casino in Downtown Las Vegas along Fremont Street. The old fashion casino hosted the World Series of Poker. I started watching the World Series of Poker on ESPN last year and wanted to visit the casino. I played low limit Texas Hold 'Em. Here is a picture I took myself at the Bellagio's walkway with Paris Las Vegas in the background. Weird weather in Vegas during the family vacation in July 2003. Early in the week, temperatures were in the 120 degrees. Later in the week, temperatures were in the 70 degrees and there was rain. Two weddings to attend in Southern California within seven days. Include the Huntington Library, Las Vegas, Hoover Dam, and the Grand Canyon plus hot, hot weather and it's going to be one hot vacation. Did I mention "hot" too much? The picture is the family in the Huntington Library. The temperatures reached the middle 90s. Our family's first visit to Pacific Bell Park at China Basin in San Francisco on April 2002. The game was the San Francisco Giants versus the Florida Marlins. Barry Bonds hit Pacific Bell Park's Splash Hit number 19 and number 20 and career home run number 581 and number 582. A generous broker gave me two courtside tickets to the Golden State Warriors vs. Houston Rockets at the Network Associates Coliseum on Friday December 28, 2001. The action was very close and different than watching basketball on TV. My cousin got married in San Diego on August 2001. While in San Diego, my family made the wedding trip a family vacation. 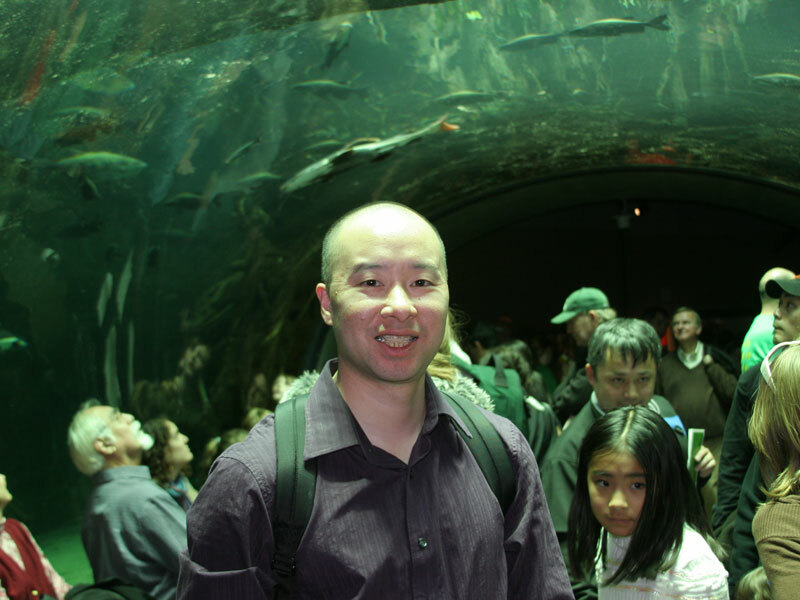 We visited the San Diego Zoo and Sea World. 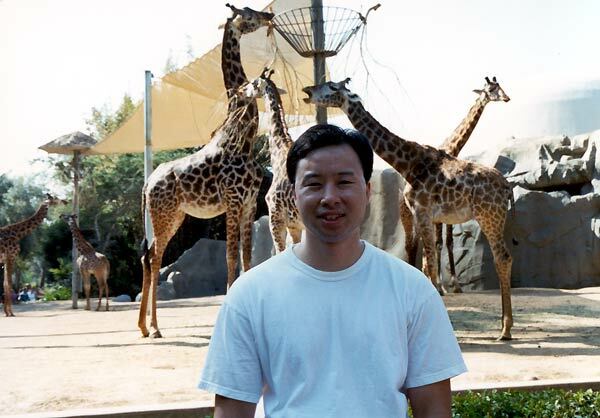 The picture shows myself in front of the giraffes eating their afternoon snack at the San Diego Zoo. On the way to one of my cousins' wedding on November 2000, the van broke down along U.S. Highway 101 Southbound along the Santa Barbara coast between Santa Barbara and Ventura. Thanks to the California Highway Patrol, we got towed to a garage, the van was repaired, and we were on our way. Nice patrol car Mr. CHP without the vision light bar. Don't underestimate the Crown Victoria Police Interceptors. My graduation ceremony at San Jose State University's Spartan Stadium on May 1998. The ceremony went smoothly and every graduate left smiling. The picture on the left is my family, my uncle's family from Alameda, and my grandfather. I thank them for attending the ceremony and their support and encouragement throughout my college life. The Summer 1997 vacation took place in Las Vegas and the Grand Canyon. The Grand Canyon has many viewpoints and trails. Bring plenty of water and wear proper shoes. Las Vegas is another great vacation spot for the family. Keep the gambling temptation in check. Another Summer 1995 vacation spot was Yosemite National Park in California. My family hiked Vernal Falls and another mountain seeing Half Dome. We did many things at Yosemite including exploring and watching featured films. We stayed in a cabin. The daytime temperatures reached the high 90s all the stores were short on ice everyday. The picture is me on top of a big rock and Half Dome is the background. On Summer 1995, my family and I went to many places. One place was Disneyland during Memorial Day Weekend. Disneyland was packed because the Indian Jones Adventure ride opened. I visited Disneyland on 1980, 1985, 1987, 1989, 1994, and 1995. The San Francisco Giants at Candlestick Park on Summer 1991. I brought everything to the game including my walkman and my glove. I never caught a foul ball. Remember SportsChannel? The photo album begins on 1978. One place I liked to visit was the McDonalds Playland located at Homestead Road and Lawrence Expressway in Santa Clara, CA. I liked the French Fries and the free toy when purchasing a Happy Meal. The picture on the left is my brother (right) and I in front of Ronald McDonald. The Playland consisted of many rides including the Grimace vibrating cage, the Fry Guys swings, the hamburger cop tree, and the cheeseburger "circular turn style" (background middle left).